Virtually everyone is coming to the realization that e-mail is the highest legal, financial, productivity, and security risk application in use today. At some point, you get fooled or you’re not paying attention. Then it happens. A malicious attachment is opened or a suspicious message (in hindsight) is forwarded. As ransomware reaches epidemic proportions, cyber criminals are actively targeting the weakest link of employees. Since your staff may not receive regular security training, a popular defense mechanism is implementing an inbound disclaimer for the receipt of external messages as shown below. The biggest advantage is spoofed or phishing emails showing from internal staff members with requests for information or having malicious attachments are flagged as external and obvious scams. The downside is whatever inbound disclaimer text selected is shown at the top of each external message. 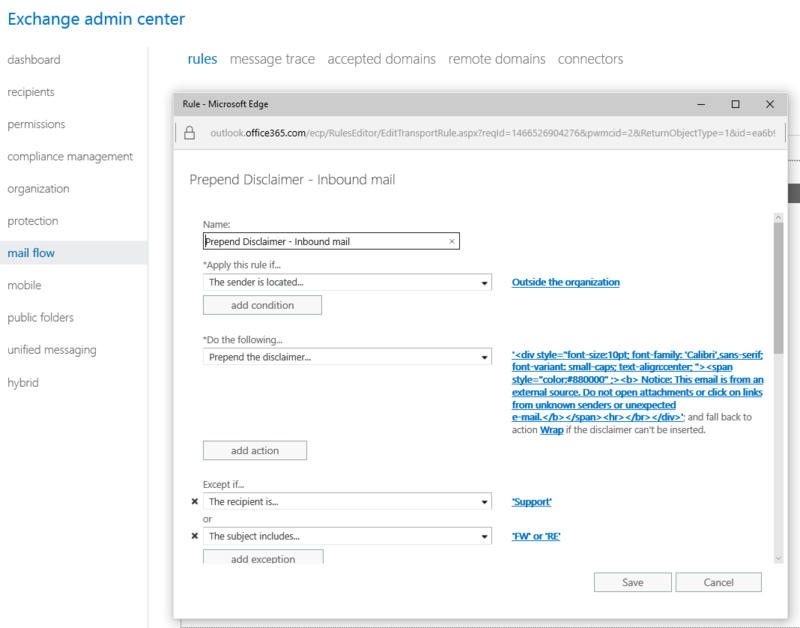 In Office 365, this rule may quickly be implemented by logging onto the Admin Portal, Exchange Admin, and Mail Flow rules. Notice that HTML may be used to control the font and color. Other options like links to notify supervisors or administrators may also be added, but usually such tactics are not recommended because of unnecessary angst for users and the effect of administrative SPAM. Matrixforce is actively implementing this rule (or something) similar for all Guardian customers. There is no silver bullet technology or process for ransomware, but this policy is just another step to help people avoid risk.